I have discovered that I am not terribly good at thinking big. It is more like; two small are better than one big. It seems to permeate my thinking and my gear lists. On the trip across Finnmarksvidda it also became evident that on top of this, Joe and I together carried a lot of doubles. Now, what are the pros and cons on this? I always carry two garments that each can be used as baselayers. Per definition I mean that only the garment worn next to the skin is your baselayer, if you wear another (sold as 'baselayer') shirt outside of that, underneath your shell, it is a middle layer. I am no fan of the sales rap about 'thick baselayers for cold weather' since my experience of baselayers like that is that they tend to transport moisture less well than the thin baselayers marketed for warmer weather. In my mind the most important thing about a base layer is that it wicks, that is keeps your skin, and especially that on your torso, as free of potentially chilling moisture as possible. In my experience 'jacks of all trades' usually are pretty lousy at any trade. So I am suspicious of baselayers that are claimed to both transport moisture and insulate. However, I have not made any scientific tests, comparing different undergarments in this way. Something for BPL? Anyway, my prejudices then are such that I feel it is better to add another thin layer on top of the wicking layer if it is warmth I need. It is also cheaper, since I do not need special winter underwear, I just use several layers of summer underwear. 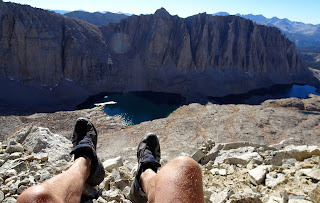 But I have covered all this extensively in Smarter Backpacking, so I will not digress further. To sum it up, somethimes I need two thin garments under my Paramo to stay warm enough while skiing. This usually happens when it is colder than -10 C or maybe less cold but with a lot of wind. I used double layers under the shell on a couple of occassions on Finnmarksvidda. On a couple of others (after my swim) I used my puffy layer BPL Cocoon under the shell, on a couple of others I used the Cocoon on top of the Paramo. While skiing that is, I used the Cocoon over the shell on almost all short and long breaks. At night I always take the base layer for the day (which is always thin merino, in winter the BPL hoody in the photo) off at night, don my other thin layer and then add the day base layer on top of this. In the morning I make the switch back, and usually put the nightshirt in my pack. So, two thin under garments are simply more flexible than one thick, and the weight penalty is usally less than you would expect. I have used lots of sleeping bags in my day, both down and synthetics. Starting out with down decades ago I switched to synthetics in the 80's because I got so tired of the down bags collapsing after a number of nights in the cool and damp climate that is predominant in Scandinavia. And now I am back to down again, because high quality down bags are so much lighter and todays sleeping bags are better at handling damp than the ones of my youth. However, for winter purposes I find the combination of a down sleeping bag (884 grams) and a synthetic 'over-quilt' (640 grams) very functional. A lot of the moisture from my body freezes in the synthetic layer, but this affects its insulative properties far less than it affects a down layer. For a couple of years I used a down quilt, but as this photo shows, the down gets pretty lumpy an non-insulating after a couple of nights in winter. The frosty flakes of condensation that tend to dribble down on you from the tent walls and ceiling are also less damaging to the loft of a synthetic quilt, I believe. The advantage with this system is also that you do not need to buy a very expensive, high quality sleeping bag for winter use; something most of us will not use for many nights every year. You can extend the reach of a good three season bag quite sufficiently to handle really low temperatures if you combine it with puffy layer pants and jackets. If I had money to spend and planned extensive camping in -25 C or colder weather, I would probably buy a good down bag rated for -20 C or so, and add the same old synthetic quilt on top of this, just as today. And considering that my current combination of quilt and bag weighs around 1500 grams, I feel that the weight penalty compared to a high quality down -20 C sleeping bag (like a WM Lynx) is small or nonexistent. Insulation under you is very important on cold winter nights. I've spent more nights than I wish to remember, trying to keep as little of my body as possible in contact with a cold pad. Double cell foam pads are not uncommon, but I find the use of a good quality foam pad and an inflatable pad, particulary the Neolite, excellent. I prefer the Neolite short since it gives me a soft bed where it counts; hips and shoulders. Its insulative properties are also excellent and I have yet to feel any chill from the ground at all, using this combination. I have used a pair of really thin gloves in winter since my army days, 35 years ago. They are needed in order to manage all the little things that require dexterity when temperatures are low. Sometimes when it is really cold you risk frostbite, or it is a least extremely uncomfortable touching for instance metal. At the same time these thin gloves will of course not keep you warm enough in deep cold, so over them I wear a pair of big, quick drying mitts. However, it is surprising how well even thin gloves will keep your hands warm enough while skiing. I always start out with double gloves if I am the least cold, and then take the mitts off after I have skied a while and my inner furnace is revving up. In fact, these days I look for the thinnest synthetic gloves I can find. They are excellent for dexterity and if they are not warm enough I simply put on the mitts. As Joe has written, you tend to wear these gloves all the time. Quite often they do get wet, since you are in snow, doing things with your hands. So drying out quickly is imperative, for that reason I do not like membranes in them. Usually you dry them out while wearing them. If I do not wear them they are in my pants pockets, otherwise they will freeze if damp. I might also add that I use these same thin gloves in summer, but without the mitts. Sometimes in summer I also bring a pair of homemade silnylon mitts that weigh 10 grams. I also carry a 2 liter Platypus bottle, but the small bottles are essential for two (sic) reasons: They should fit in your pockets and they should fit in your boots. The ones I use are really light; they used to contain drinking yoghurt. Any plastic bottle used for food will be of excellent quality and shopping around you will be able to find almost any size you want. Cheaper and lighter than the ones from the outdoor stores. I've written about hydration in the chapter from last years Sarek trip, so I will not repeat that here. But I can add that having soft big bottle like the Platypus has its advantages compared to a hard one. On Finnmarksvidda I stupidly broke the cap of one of my small bottles, making it useless. But I could still thaw my boots out with one small bottle and the nicely formative soft Platypus in the morning. A hard 2 liter bottle would have been useless for this. Using two puffy jackets instead of one is also a cost saver. For many years I had a huge double down jacket for 'expedition use'. However, it weighed 1600 grams. There are lighter jackets today, but I did not want to spend the money necessary for a thick winter down jacket, for the same reasons that I did not want to buy a winter sleeping bag. I use it too seldom. So, a couple of years ago I decided to test my 410 gram WM Flight in combination with my 320 grams BPL Cocoon. This turned out to be a success. The combination was light and kept me warm enough on -20 C mornings, cooking outside the tent and strolling around in my puffy layer pants, also BPL Cocoon. I am sure these double puffies would be sufficient in even lower temperatures as long as I am reasonably active around camp. When I am not moving about I would simply sit in my sleeping bag instead. I have also considered making a hole in my quilt, turning it into a poncho when needed. This I have done with my down quilt and it works very well. With this combination I would have enough warm garments for any weather. This is usually a good bet for winter. Often you need one, less warm, cap for when you are active and it is not that cold. For camp and when sitting around in deep cold you need something really warm. What I wear on the trail is a Paramo cap with a beak, which is really nice in hard wind and also as protection against the sun. It is windproof and reasonably water proof. That is, it leaks after 10 minutes of steady rain, but that is usually no problem in winter. And if so, I just don the waterproof hood of my Paramo smock. The second cap is the hood of the BPL Merino Baselayer. I use this under the Paramo cap sometimes when skiing, since the Paramo is not really very warm. However, it wicks and breathes very well. 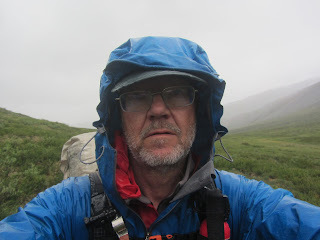 On a couple of occasions on Finnmarksvidda I used the merino hoody under the Paramo when skiing, to protect forehead and brow. This was when we skied against the hard wind. At that time I also used the hood of the Paramo smock. Three layers in all, good for basically any weather while active. Sitting still I would add the BPL Cocoon smock with its insulated hood. It can be argued that the rulk (rucksack+pulk) in fact means two possible ways of transporting the gear; pulling it or carrying it. There is no arguing that when the going is good it is very much easier and less energy consuming to pull the gear behind you. But at times, when the pulk going is not so good, it is very handy to just hoist it onto your back. It truly is the best of both worlds. A problem might be that when you are looking at improving the concept from where it now stands, you tend to move either in the direction of a pulk or a pack. The consequences are that if one gets more functional the other becomes less so. For instance, pulling the rulk with poles attached instead of lines would increase stability, but make it less easy to swing the whole thing onto your back. But I am looking forward to see what can be done in the future with the concept. As a team Joe and I had lots of doubles. We discussed this beforehand and landed at: Since all our gear is very light, we cannot save very much weight by replacing our current gear with gear that would serve us both. Joe also wanted to practise with his gear and techniques for solo winter trips. Considering that our two tents only weigh about 2,5 kilos together, it is not easy to find one good winter tent that weighs less. A Hilleberg Nallo would, but we did not own such a tent. My old Hilleberg 3-person Keron with plenty of space and bombproof to booth, weighs over four kilos. And of course, with two tents we had one spare, we could have survived in one tent. We could maybe have saved a couple of hundred grams by skipping one stove and using a larger pot. However, this would have made melting snow and eating more complicated since we had most of our meals in our respective tents. Also, having one stove, the Spider, that could be used with inverted canisters, might be considered a safety precaution by some. Since I have lots of confidence in my Primus Micron down to -20 C, if I keep the canister warm, this does not bother my very much, but it felt comforting anyway. We could have put all our gear in one big Paris pulk and taken turns pulling it, but that would have completely ruined the whole rulk concept. It would have been impossible to carry it on our backs. The two rulks could, in an emergency, pretty easily have been turned into one pulk unit in which Joe could have pulled me to the nearest hospital. I have holes drilled near the tops of my skis to make it easier to turn the skis into an emergency sled. Coupled with the pulks this would have been very easy and a stable emergency vehicle. As for our true emergency gear it only weighs about 100 gram for each of us. So in total there was little to be gained from combining that stuff. It can even be argued that there is safety in both of us having all the gear we needed, should we for some reason, like whiteout, become separated. That can in fact happen, and it almost happened to me years ago, that I lost sight of my team mate in hard wind and swirling snow. To sum things up; modularity gives greater flexibility and saves money without incurring much of a weight penalty if you use light gear. Modularity and mutlifuntionality are the way to go! One question, óf your two sleeping mats, which do you use on top, and does it matter? Dave - I know some people say to put the inflatable under the CFF for less convective heat loss but I find it more comfortable on top. Oh, and on the 'two of everything' issue. I find having two skis infinitely superior to having one. Having just gotten a lightweight down bag, I have wondered about the loss of insulation due to compression when covered in a pinch with a quilt or fleece blanket. What have you experienced? Is down compression preferable to moisture accumulation? If you want to wan to use your sleeping bag as a puffy layer, them maybe you want to have a look at the Exped Dreamwalker series. I've used this for a few years now, and it works great. No direct link possible, I'm afraid. Just keep on clicking to sleeping bags and Dreamwalker. I have always used the inflatable on top for two reasons; it is smaller and it is more puncture prone. But I guess this is up to everyone to do as they feel is natural and comfortable. My feeling is that differences in insulative capacity between doing one or the other would be hard to notice in the field. The quilt weighs 660 grams spread out over, say, 1,5 sqm. Very little pressure is exerted on the down. The millimeters lost in the down would be very efficiently offset by the centimeters of the quilt, creating a considerable net gain. And I am also convinced that the moisture accumulated in the quilt causes less loft loss than the same amount of moisture would in the down. Added to this is also that recent findings published by a BPL member indicates that loft does not rule supreme. That is, more grams of down tend to insulate better even if it is compressed. Kept dry, that is. I would not consider a fleece inner bag or quilt since fleece have poor insulative qualities compared to its weight. Modularity makes sense to me. Mix and match based on the conditions you expect for any given trip. Great info there and thanks. PS I liked the Finmarkvidda story!! On Dreamwalker: Yes, this is a type of sleeping bag that seems to come and go. If you are sitting still, bird watching or hunting, cold mornings it should be great. When it comes to quilts I guess JacksRbetter (http://www.jacksrbetter.com)are the thought leaders. I made a poncho out of my down quilt (with the lumpy down above)a couple of years ago. I read quite a few books this winter, preparing for a summer trip, about fur hunting and prospecting in northern Canada. The answer to siwashing in cold is usually spelt FIRE. In deep cold we talk huge fires. So far the classic Swedish 'nying' fire seems hard to beat for those purposes. But that is in coniferous forests. Looking at Finnmarksvidda where it is difficult or impossible to build a fire of a suitable size I imagine raindeer skin clothing was the life saver. Plus not galloping around the countryside in poor weather unless necessary. Another thing to be noted for outdoor living in those days was that you had to 'pack a lot of tough'. But those were different times; being cold and hungry was all in a days work for many people. I agree that two of a thinner/smaller item which amount to a thicker/larger item when added together clearly make a lot of sense unless there is greater functionality (e.g. breathability) to the larger item because of fewer layers. I took two base layers on the TMB and will be doing the same thing on the Classic Haute Route - a thinner, short-sleeved layer for hotter conditions (Montane Bionic) and a thicker base/mid-layer for colder conditions (Patagonia R1 Hoody). My primary windproof/warm layer will be a Rab Vapour-Rise hooded pull-on. All three are base layers if need be, and the last two can be worn with one or two base layers underneath. Three tops permit me the maximum functionality for less than 1kg. The V-R is very water resistant too. That's the problem with the Alps on a long distance trek - you get a wide variety of temperatures and taking more than 3 tops is crazy but you need to cater for a lot of weather changes. Yeah, flexibility is the name of the game plus the realization (not as obvious as one would think) that you could and should wear all garments if need be. And if you go for really thin and light garments the weight penalty is not as big as you would expect. For example I usually have three pair of gloves and often three pieces of headgear (if Buff is seen as headgear). But I have only one baselayer (if it gets wet, I'll dry it or change to my powerstretch midlayer). This far I have used only one thick down jacket but I think that I'll change to one mid-weight (but still full-winter) down jacket combined with very light down vest. Combining down sleeping bag with synthetic overbag/quilt is IMO the most superior solution for prolonged winter use and if there would be totally no change to dry them occasionally (for example good sunny day at least once a week) then I might add VBL but I'll have to test it first... But after my Svalbard expedition I'm considering changing the weight-conscious combination of big down bag + light synthetics to a more versatile system of heavy synthetics + light down. PS. For some reason I couldn't use my WP account to comment? Caused an repeating error. It would be interesting if you could get into detail on the differences you perceive between what you call expedition and and what you term ultralight. I do not know about problems with comments on our site, but I have experienced it myself several times lately on other Nordic Lightpacking sites recently. Anybody know? I might write a post to my blog about the differences I perceive between different systems and styles. But at the moment the outcome is that despite having more experience in "summer" hiking (the seasons with not much snow) I find winter travel (a lot of snow and cold, skis + pulka) and living easier and more satisfying. The reason might be that for summer hiking I'm quite actively trying new things and sometimes go wrong but for winter use I've adopted very soundly tested and very well working system that enables comfortable living even in very hostile environments for months at a time (with the prerequisite of having enough food and fuel for that time).